I'm HR director for our Singapore operations as well as the compensation & benefits lead for Asia-Pacific. 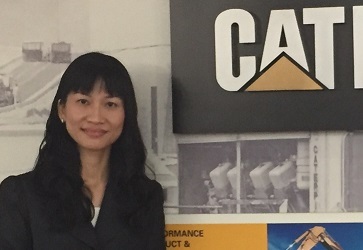 I joined Caterpillar 16 years ago and have taken up a number of different HR positions covering learning and development, recruitment and now compensation & benefits. Before Caterpillar, I was in the public sector as head of HR development at the Subordinate Courts. I joined Caterpillar as I wanted to sample life in the private sector and I've never looked back. Caterpillar is truly one of the great organisations in the world and they have placed a huge emphasis on human and talent development. This has kept it interesting for me over the past 16 years. My current role is interesting for me as I get to work with employees from different countries, cultures and backgrounds. I also develop programs that address nuances in the different locations whilst keeping the overarching enterprise strategy in mind. One of the reasons why I've stayed in HR for so many years is that I have a real passion for working with people. Compensation & benefits is such an important part of HR development as it is one of the key tethers that helps a company attract and retain the best talent in the industry. Despite the fact that we use a lot of data and market research to help us make decisions, sometimes it’s really an art to build a plan for a particular location that can make the difference between a motivated workforce and an unmotivated one. My short term goal is to continue to build out the compensation & benefits team with greater diversity and deep local expertise in the business. The heterogeneous nature of Asia-Pacific is a great advantage as it enables us to build that diversity which brings in a wide variety of viewpoints and perspectives to our decision making. I will be very happy to hear from a local facility manager that my team member has contributed greatly to the success of his or her business. If you have one piece of HR advice to offer, what would it be? One common feedback about HR that I hear a lot is that we don't understand the business. This should be a fundamental requirement of all HR professionals. Having HR-specific skills and knowledge is not enough; we need to understand the business at the ground level, the issues and challenges that they face, their goals, and business objectives. That is why I make it a point to spend as much time out in the field as possible. I also make this a starting point for my team members: they should get to know their business partners well and then we can help them do their jobs better. I spend about 30 to 40 per cent of my time on the road so I cherish my time with my husband and two children even more. I also ensure fitness activities are in my schedule whether at work or in my spare time. I've managed to combine the two through Zumba lessons with my daughter on weekends. Giving back to the community is also important to me and I'm glad that Caterpillar has a strong culture of corporate philanthropy. One of the causes we support in Singapore is Junior Achievement and through this, I've taught enrichment classes to secondary school students. As a family we also participate in voluntary activities so as to start building the spirit of giving back in our kids.